On September 30, 2009, José Manuel Hernández Martinez, also known as “Don Chema”, was taken captive under arbitrary circumstances in the 28 de Junio community of Venustiano Carranza. 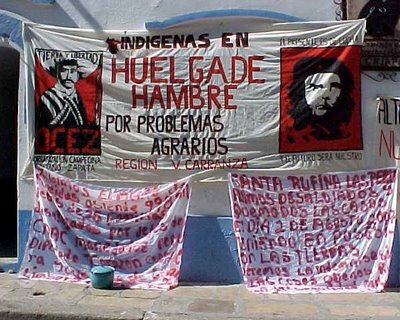 Hernández Martinez is one of the main leaders of the Emiliano Zapata Peasant Organization (OCEZ) in the Venustiano Carranza region. At the moment, he is held in the State Centre for Social Reintegration of the Convicted(CERSS) No. 14, “El Amate”, in Cintalapa. According to various sources, a group of people wearing Federal Electricity Commission (CFE) uniforms entered the 28 de Junio community, on September 30, asking residents if they were having problems with their electricity. When they located José Manuel Hernández Martinez, the men in disguise kidnapped him in their van, which appeared to be a CFE vehicle, and fled the community. Supporters of Hernández Martinez went in pursuit of the van in an attempt to rescue him, however, they were attacked by firearms and their vehicle crashed. Jordán López Aguilar was killed in the crash and José Santos López Aguilar, Juan Jiménez Zepeda and Ballardo Hernández de la Cruz were injured. Late that night, it was confirmed that Hernández Martinez was held in the CERSS No. 14, “El Amate” and that the operation had been conducted by agents from the Federal General Attorney’s Office(PGR, Procuraduría General de la República)and from the Attorney General’s Office of the state of Chiapas (PGJE, Procuraduría General de Justicia del Estado de Chiapas). According to local accusations made after he was taken into custody, Hernández Martínez was not presented with any warrant for his arrest. However, according to the federal government, there were previous inquiries and warrants against José Manuel Hernández Martínez for such crimes as criminal conspiracy or aggravated damages. It must be acknowledged that the capture of José Manuel Hernández Martínez occurred during a period of increased hostility regarding the efforts of human rights defenders and of criminalization of social protest. In the last three months, there has been a smear campaign against Frayba, which included an armed attack against one of their members and the adherants of The Other Campaign of San Sebastián Bachajón and Jotolá, as well as acts of harassment against members of the FNLS. A few days prior to the capture of José Manuel Hernández Martínez, a stranger set fire to the K’inal Antsetik A.C. facilities, a feminist organization that is affiliated with Yolanda Castro, local leader of the FNLS. This entry was posted on Saturday, October 17th, 2009 at 9:42 am and is filed under Chiapas, Human Rights, Justice system, Uncategorized. You can follow any responses to this entry through the RSS 2.0 feed. You can leave a response, or trackback from your own site.